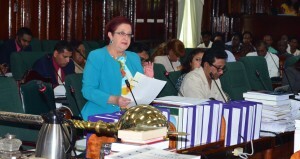 For a second consecutive year the dismissal of hundreds of Amerindians under the Community Support Officers (CSO) programme took center stage during the Budget debates as Opposition Chief Whip Gail Teixeira accused the government of the “willy nilly” dismissal of contract workers. Teixeira, who opened the debates on Wednesday, was quick to criticize the government’s hiring of more contractual workers while dismissing others. She stated that since the government has already commissioned quite a few Commission of Inquiries, it should launch one into the effects of the alleged dismissals. “You keep going through things like a bulldozer in a China shop all the time…you need be sensitive about these things,” she stated. Teixiera reminisced on her on dismissal saying that there was no need for such since she knew that a change of President meant her time as Presidential Advisor had passed. “I got terminated as you know…I didn’t need to get terminated…I was a President’s lieutenant…I didn’t need to get a nice official letter from Harmon saying I am terminated and all my benefits have been forfeited,” she stated. In a rebuttal at the start of her speech Telecommunication and Tourism Minister Cathy Hughes reminded the Chief Whip that the government reserved the right not to renew contracts as it sees fit. She pointed to a government contract with a pharmaceutical supplier signed under the previous administration. Hughes stated that while government has already paid for the medical necessities the delivery obligations have not been upheld by the supplier – New Guyana Pharmaceuticals Inc.
“We had paid for drugs which are yet to be delivered and were paying more for a drug that we should not have been paying for,” the Minister noted.